Here is a photo journal of the initial visit that supporters made to the Oregon State Capitol last January to lobby for SJM 5, a joint resolution that passed this month urging the United States Congress to enact legislation creating an Office of the National Nurse (ONN). Congrats on the creation of the ONN! Awesome! I have made it officially one of my life's mission to impact nurses with what I do. Making the working world a safer place for nurses so that they can care bette for their patients. If I can ever help, let me know! Thanks for your good wishes! Just to let you know though, this is a memorial that passed urging the US Congress to enact legislation to create the ONN-- it is not created yet. Please email me (teri@nationalnurse.info) and I will add you on the list to receive the National Nurse newsletter so that you can keep up to date. The Board of Directors of the National Nursing Network Organization is pleased to announce RNs Working Together voted during their most recent Executive Council meeting to fully support the Office of the National Nurse initiative. We would like to thank the leadership body of this important organization for recognizing the enormous potential an Office of the National Nurse will have on improving the health of the nation and elevating the nursing profession. RNs Working Together is the largest organization of working registered nurses in the United States, with nearly one-quarter of a million members. "As a nurse and a union leader, I believe that creating the Office of a National Nurse is a good way to enhance nursing recruitment and support policies that strengthen nursing education and practice," says JNESO Executive Director Virginia Treacy, RN. RNs Working Together is America's largest organization of working registered nurses, with nearly one-quarter of a million members from 10 AFL-CIO unions. We unite the collective energy and strength of our members to promote the role of registered nurse as the patient advocate in the workplace, highlight the skills and value of working nurses and push a legislative agenda that advances the cause of safe, quality patient care. We believe in fighting for a health care system that serves everyone. No one understands better than our nurse members that we can’t fix our economy until we fix our broken health care system. At the same time, nurses will tell you that reform is not just about number crunching and corporate power struggles — it’s also about improving primary care services by integrating disease prevention strategies. Our health care system should empower and encourage nurses to educate and counsel patients about the importance of simple preventative measures. Together, we need to foster a culture of prevention. That’s why RNs Working Together supports the concept of creating an Office of the National Nurse. We believe that elevating the Chief Nurse Officer of the U.S. Public Health Service to full-time status and renaming this position as the National Nurse is a way to promote the visibility of nurses in the national health care debate and give nurses another voice at the federal policy table. Working nurses know how important it is to have a voice — both at the federal policy level and on the local health care delivery level. Everyday, staff nurses in our country use their powerful union voice to bring attention to unsafe staffing levels, and other problems that negatively affect patient outcomes. Joining a union gives nurses the protection and resources they need to be effective patient advocates. When nurses join unions, they pull up a seat at the table. As union nurses, we are happy to lend our collective voice towards this effort because when nurses have a voice, patients get better care. Salem, Oregon – Today Oregon lawmakers voiced their support of SJM 5, a joint resolution urging the United States Congress to enact legislation creating an Office of the National Nurse (ONN). Oregon joins the State Houses of Vermont, Massachusetts, and New York who have also passed similar resolutions. Representative Michael Dembrow (D-Portland) was the Chief Sponsor in the House and carried the bill on the floor. “This is a special bill for me because the effort to create the ONN had its genesis with two of my colleagues at PCC," said Dembrow. "As a nation, we need to move toward a focus on preventive care, and it's important to spotlight the role that nurses play in our health care system," he continued. "Creating an Office of the National Nurse will increase attention on these critical issues, and I was honored to carry the bill on the floor." The intent of creating an ONN is to focus on strengthening the work of existing groups such as the Office of the Surgeon General, Medical Reserve Corps and community agencies through a more robust and modernized nursing leadership presence. Nurses are well positioned to provide this much needed change as they are 2.9 million strong, the most trusted of all health professionals, span all cultures, and are accomplished health educators. The ONN would not be a "cure- all" for the problems in health care but will assure nurses are positioned to promote changes in our nation’s health systems that will emphasize prevention. ” Nurses witness daily how the healthcare system is failing the American people, including thousands of Oregonians. Eighteen other countries do better than the U.S. at reducing preventable deaths. Every year $1.3 trillion is spent on managing the impact of the 7 most common chronic diseases, many of which are preventable. 30% of the American adult population is now obese. The American Diabetes Association (2008) reports that the total estimated cost of diabetes care in 2007 was $174 billion and fifty-four million additional Americans have pre-diabetes, placing them at high risk for developing type 2 diabetes. For more information visit http://nationalnurse.org . This is wonderful news! Congratulations!!!! I'm looking forward to the NNNO's continued success with efforts to establish a National Nurse!! The March issue of Nursing 2009 features a guest editorial by NNNO Board President Teri Mills MS, RN, ANP, CNE on the Office of the National Nurse initiative. The goal is to elevate the Chief Nurse Officer of the USPHS to a full time position and to have Congress bestow this position to be the "National Nurse" thus ensuring prominence and increasing public awareness to promote health at the national level. The National Nurse would complement the work of the US Surgeon General to improve health literacy and reduce health disparities. "The nation is ready for change. It's time for nurses to call for leadership that will position nursing on the front line. Now is the time for a National Nurse." Nursing’s circulation is 255,000 world-wide. 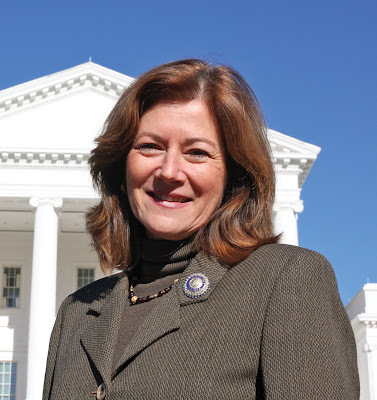 Thank you to Margaret Vanderhye who represents the 34th District in the Virginia House of Delegates for sending the following letter in support of creating an Office of the National Nurse to Congresswoman Lois Capps (23-D), Co-Chair of the House Nursing Caucus. I am writing in strong support of the initiative to create an Office of the National Nurse. As the public health demands of the 21st century become more evident, the need for a national focus on health is clear. In particular, our country needs to promote preventive health, not only in policy but in practice. Our large and diverse nursing workforce is an existing resource that can quickly be mobilized to advance the important work of prevention. An Office of the National Nurse would help develop and implement the policies and programs necessary achieve such a mobilization. As I understand it, we would not need to add additional staff or funding to establish the office. Congressional action is needed to formally bestow the unique title of National Nurse on the Chief Nurse Officer (CNO) of the United States Public Health Service (USPHS) in order to provide the status, authority and public recognition necessary to lead large scale prevention efforts and shift to a culture of prevention in US healthcare. Designating the existing CNO, who also serves as Assistant Surgeon General, and elevating this position to a full time status within the Office of the Surgeon General provides a pragmatic and cost effective solution. * Supporting and justifying additional funding for nursing education, research and service. The establishment of the Office of the National Nurse would set a new standard for a more accurate and realistic recognition of nursing's importance to health and healthcare in the United States. You have my fullest support for the legislation you have introduced to create an Office of the National Nurse. Thank you to Advocacy Director Steve Dixon and Oregonians for Health Security for their strong statement in support of creating an Office of the National Nurse. I write on behalf of Oregonians for Health Security, an advocacy organization committed to uniting working families, small business owners, seniors, health care workers, community leaders, and policy makers in the fight for quality, affordable and secure health care for all Oregonians. We believe preventive care must be included in any basic benefit plan that promotes health and eliminates economic and racial disparities. We strongly support your efforts to recognize the important role nurses play in promoting preventative care in this country. Your endorsement of symbolic national nursing leadership to support a philosophical and cultural shift toward prevention in the U.S. health care system is essential not only to Oregonians but to all Americans. Oregonians for Health Security supports efforts to rename the Chief Nurse Officer of the U.S. Public Health Services as the "National Nurse" to elevate the authority and visibility of that office in the national health care debate. Chronic conditions - diabetes, asthma, obesity, and others - pose the single greatest threat to the health of Americans and our nation's economy. Nurses provide key care services in the prevention and management of these conditions and we commend your efforts to recognize their work, promote prevention, improve outcomes, and provide guidance for state and local leaders in mobilizing nurse volunteers. Our new administration and Congress - and their clear commitment to wellness and prevention - present an ideal opportunity to advance the concept of a National Nurse and make it a reality. Oregonians for Healthcare Security support legislation to achieve these goals and look forward to working with you on this important issue. Please do not hesitate to contact us should you need further information or assistance. Thank you to President Patricia Ann Bemis, RN CEN, the Board of Directors and the more than 400 members of the NNBA for their strong support of elevating the CNO of the USPHS to a full time position and be officially designated as the National Nurse. I write on behalf of the board of directors and the more than 400 members of the National Nurses in Business Association (NNBA). We support the efforts that are underway to recognize the important role nurses play in promoting preventative care in this country. Your endorsement of symbolic national nursing leadership to support a philosophical and cultural shift toward prevention in the U.S. health care system is essential and important to our members. We strongly suggest the existing Chief Nurse Officer (CNO) of the US Public Health Service (USPHS) position, who also serves as the Assistant Surgeon General, be elevated to a full-time position within the Office of the Surgeon General. In addition, we recommend that it be officially titled the National Nurse. This will give it the authority and visibility in the national health care debate. Chronic conditions (diabetes, heart disease, obesity, and others) are threats to the health of Americans and our nation’s economy. Nurses provide key services in the prevention and management of these conditions. Nurses provide key services in the prevention and management of these conditions. We commend this administration’s efforts to recognize their work, promote prevention, improve outcomes, and provide guidance for state and local leaders in mobilizing nurse volunteers. The new administration and Congress and their clear commitment to wellness and prevention as evidenced by the appropriations allotted in the stimulus package last week present a window of opportunity to advance the concept of a National Nurse and make it a reality. NNBA and its members support legislation to achieve these goals and look forward to working with you on this important issue. Please do not hesitate to contact me should you need further information or assistance. President National Nurses in Business Association, Inc.
"Founded in 1990, the Case Management Society of America (CMSA) has grown to be the leading non-profit association dedicated to the support and development of the profession of case management. It is based in Little Rock, AR, and serves more than 11,000 members, 20,000 subscribers, and 70 chapters through educational forums, networking opportunities, legislative advocacy and establishing standards to advance the profession." It gives me great pleasure to announce the support of the Case Management Society of America (CMSA) for the Office of the National Nurse initiative. After careful consideration by the Board of Directors, the Public Policy Committee, and our membership at large, we have concluded that the ONN initiative encourages many of the strategies that we, as a professional organization, believe to be key initiatives to improving the healthcare of our citizens and controlling escalating healthcare costs. Most notably these initiatives support the work that case managers across the continuum of care perform each day as they emphasize preventative care and empower patients toward self-management. Case managers also encourage collaboration between all health care professionals in order to break down silos that cause fragmentation throughout the healthcare system. The practice of case management is a multidisciplinary practice, made up of nurses, social workers, respiratory therapists, and other healthcare professionals who care for patients in every setting throughout the continuum. Case managers work collaboratively with all members of the healthcare team as well as with the patient and the family to ensure patients at risk receive safe, quality evidence-based medicine, in the least restrictive environment for the most cost effective price. The Case Management Society of America is the largest not-for-profit professional organization supporting those in the practice of case management. CSMA takes great efforts in all of our actions, to reduce the natural tendency to create and build higher silos within healthcare. We are very pleased to offer this letter of support to ONN, working with you in your efforts. By way of this letter, you have permission to include our name and logo in promotion of the initiative.